Make a difference by gifting something that goes beyond flowers and chocolates. Harmonize the living of your loved ones by gifting serene God idols. Be it Gautam Buddha Kanha, choose from FlowerAura's divine range of God idols that shall be perfect to spread your message of affection and spirituality. In this fast paced life, everyone longs for some spirituality and what better way to fill someone’s life with good fortune and happy times than to gift them something chaste and pure that they will cherish. Our divine collection of god idols is all about that and a lot more. If you are looking for something that will add a sense of contentment and tranquility in your loved ones’ lives, then have a look at our divine collection of god idols online at our portal comprising of Lord Buddha statue, Lord Ganesha statue, Feng Shui gifts and more that will bring good luck to your special people. 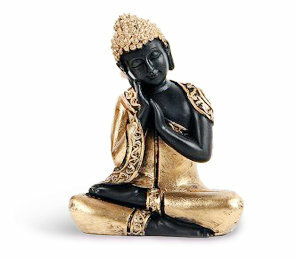 You can also buy them for your home and these statues and figurines as they will further enhance your home decor. God Idols are perfect gifts to convey regards to your Dad as the unique father's day gifts for upcoming fathers day occasion. We have a large variety of options to choose from such as Kanha on the chowki for all Krishna devotees, Divine Ganesha idols for the ones starting something new in their lives, Lord Budha to heal and eliminate the inner ills. We also have combined the divine idols with sweets and handmade chocolates to turn them into perfect gifts for all the occasions. Get a serene hamper of Laxmi Ganesha murti with a three layered bamboo plant in a glass vase that brings good luck. Or the calm Lord Buddha along with Feng Shui shell tree. You can also opt for Lord Ganesha murti along with the scented candle. Besides, if you are looking for Krishna idol or Sai Baba idol online, we have it all to suit your needs. The options are so many. FlowerAura has brass idols online at the portal of almost all deities. Whether it’s online shopping of lord Krishna idols, ganpati murti or Sai baba etc, find them all at our portal with ease. No matter if you are looking for gifts for husband or your wife, FlowerAura is your go-to place to make a perfect pick of god idols for every relation. Deepen your spiritual and meditative practice by creating a sacred space. Enlighten your surroundings with these divine idols that can form a wonderful present for Father’s Day, Mother’s Day, Teacher’s Day, Parents’ Day, Grandparents’ day and more. You can also gift these on your elders’ birthdays and anniversaries. Be it Diwali, Holi, Durga Pooja or any other Indian festival, these shall make the best gift for girls and colleagues and shall definitely bring a smile on their face. Besides, all these statues and assortments will bring peace, harmony and calmness to the recipient’s life and also bring good fortune for them. You can also order these god idols for home like Krishna murti, Ganpati murti etc. Add visual charm while bringing in peace and divinity to your surrounding with these tranquil hampers. Explore your spiritual side here. FlowerAura offers fast delivery of your hampers to your loved ones so that your expression of care does not go amiss. While you sit at the comfort of your home, we shall make home delivery to your dear ones that comes along with the good news of free shipping. With a network in 200+ cities, FlowerAura is here to delivery your tokens even in the remotest corners. Therefore, it’s time to order scintillating god idols from FlowerAura and make your expression a divine one.